This can be used on NiFE or Lead Acid flooded batteries. Always ensure the levels are topped up before and check at regular intivals as this charger is designed to give a continual equalisation charge. For NiFE you can run for long 24Hr+ EQ charges to bring the power back into the NiFE bank. A NiFE bank is impossible to overcharge so you can check the fluid levels occationally but generally leave it for the charge period. For Lead Acid you should only run 2-4 hour EQ charge and should monitor the battery bank regularly during the EQ charge. Set the required voltage and current on the charger and connect to the batteries and charge to the length of time you require. For NiFE batteries you can charge them upto 1.75V per cell, so for a 48V bank that would be 70V and 24V bank 35V. If you have less than a 400ah NiFE bank then you should reduce the current from its maxium to 20% of the AH of the batteries. Eg a 100Ah bank should have an EQ charge at 20A and a 50Ah bank at 10A. For Lead Acid you would EQ at around 60V for a 48V bank and around 30V for a 24V bank according to your need and the batteries you have. Can also be used to give a standard battery charge by setting the voltage to 57.6V for 48V bank and 28.8V for 24V bank. If you monitor the current on the screen you will see the battery is charged when it is no loger accepting any current. Extreme care should be taken when using this unit to ensure you set the correct voltage. It is possible to destroy a battery bank if you put in too high voltage. You can also use this to apply constant voltage in order to try to recover batteries. Please note this unit does not come with battery leads, you should use some 10mm - 16mm cables from the terminals on the charger to the terminals on the batteries. These should be cables with lugs and bolted to the battery terminals, not just clips like with a little battery charger. Disconnect all other chargers and loads from the bank. Keep an regular check on the Amps on the output to ensure they do not go over 20% of AH. Keep a regular check on the temperature of the cells, if you feel they are getting too hot, turn off a let rest for a few hours before resuming the charge. 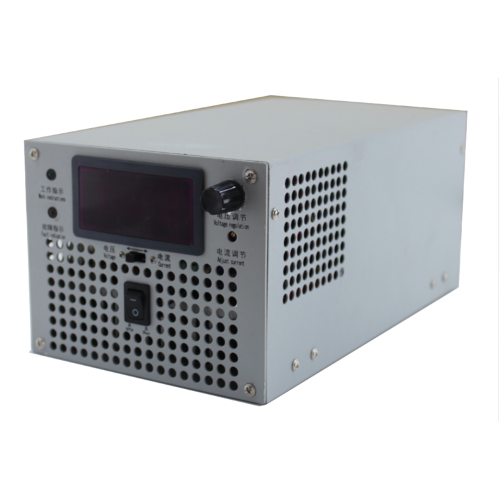 If recovering power from a bank you may need to increase the initial charge to 1.7V or 1.75V per cell.